Choosing an electronic cigarette can seem like a daunting task, but it’s not as complicated as you might think. Most people would agree the best electronic cigarette is between the clearomizer vs cartomizer designs. This guide will give you the round up of the two. The UK’s best selling electronic cigarette kit is the clearomizer system and is available here. The Clearomizer is a transparent tank with wicks that feed e-liquid into a atomizer at the top of the device. A Clearomizer starter kit is possibly the best electronic cigarette for a first time user. They are very easy to fill, you can clearly see how much e-liquid remains and performs great with minimal hassle. They have a longer lifespan than the cartomizers and can be cleaned to extend their lifetime. An upgraded version also allows you to replace their heads making them very cost efficient. The Cartomizer is a tube filled with material which soaks up the liquid feeding it into a atomizer located at the bottom of the device. The Cartomizer takes slightly longer for the initial fill (3-5 mins) and needs filling slightly more regularly. They are very cheap and great if you like to use a lot of different flavours (you can have several with a different flavour in each). They are great for on the go as they can be shaken around and carried upside down in your pocket and wont leak. They produce great vapour and slightly stronger flavour than the clearomizer. The choice between clearomizer vs cartomizer is subjective and either system is a fantastic starting point. 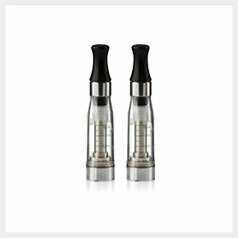 We recommend the clearomizer to most first time users simply because they are so easy to get started with. We would recommend anyone who hasn’t tried a cartomizer to give them a go. They give a great experience and deliver awesome vapour and flavour. More discussion about the clearomizer vs cartomizer can be found at the e-cigarette-forum. Both systems are available as starter kits from the CigElectric shop.